Unless otherwise noted, all performances take place at Joe’s Movement Emporium, 3309 Bunker Hill Road, Mount Rainier, MD, off Route 1 just outside northeast DC. Tickets for upcoming shows can be purchased at joesmovement.org. In this (slightly) deranged (new) annual aerial tradition, UpSpring explores what would happen if the Nutcracker took place on Halloween. Skeletons, snow ghosts, and sea monsters dance and dangle from the ceiling. And Clara is a…WHAT?! Featuring new work by UpSpring students and instructors. December 2nd at 6pm at Joe’s Movement Emporium in Mount Rainier, MD, just across the northeast DC line. Tickets at joesmovement.org. Though not specifically geared towards youth, this slightly spooky performance should be fine for most children. Don’t miss our annual works-in-progress showing at Joe’s Movement Emporium! This performance offers a peek into current projects and collaborations by students and staff. See new aerial work, experience movement improvisations, and hear a live musical performance by Kiersten Whitehead. Allow your own imagination to expand as you watch students share expressive work on a variety of aerial equipment. Come early and take an aerial mini-lesson in the lobby from 5:15-5:45pm. Concessions sold by Mount Rainier Elementary School PTO will support arts programs for local students, so bring a few bucks and have a snack to support our neighborhood school. And be sure to stick around after the show to chat with us about our work and your own thoughts and aspirations. Sunday, December 3rd at Joe’s Movement Emporium in Mount Rainier, MD. Tickets $15 at joesmovement.org. Children 2 and under free in an adult’s lap. On July 1, UpSpring had the pleasure of participating in the Smithsonian Folklife Festival on the National Mall. Andy Clark, Karen Fox, and Jennifer Beeson performed excerpts from POP! Alana Cole-Faber performed on dance trapeze in the Arts and Industries rotunda. We had a fantastic time at the festival with our fellow circus colleagues! On Sunday, June 4th, join us for POP! In this production, UpSpring Aerial Lab uses pop art as inspiration for new work in aerial fabric, aerial sling, dance trapeze, mini lyra, and poi. Featuring work inspired by Andy Warhol, Marisol, Roy Lichtenstein, May Wilson, Claes Oldenburg and more. Tickets $20 adults, $10 children and seniors. Children 2 and under free in an adult’s lap. Get your tickets at joesmovement.org. UpSpring Studio presents our annual Works-in-Progress Aerial Recital, featuring new explorations on trapeze, fabric, and lyra by UpSpring’s talented students and instructors. Tickets are $15 at joesmovement.org. (Children 2 and under free in adult’s lap.) Also, join us during intermission for a raffle and refreshment sales by the Mount Rainier Elementary School PTO. Proceeds from the raffle and refreshment sales support arts programming for local children. Come on out and show your support for the arts! What would you do in an apocalypse? UpSpring Aerial Lab explores multiple responses to the end of the world. Featuring performances by UpSpring’s advanced students in aerial fabric, trapeze, hammock, poi, and more. Tickets $20 adults and $10 under 18/over 65 at joesmovement.org. The Clarice and Joe’s Movement Emporium present SWING as part of The Clarice’s NextLOOK series. SWING is a performance-in-progress featuring UpSpring artists/instructors Kirsty Little, Mara Neimanis, and Alana Cole-Faber. These artists combine aerial choreography with community voices to create fresh, honest aerial movement integrated with the audience’s own stories. SWING will examine what the word “swing” sparks in the imaginations of community members in order to devise narratives for an aerial performance. The aim is to fly the community’s stories so the audience can actually see themselves reflected in flight. Join us for a free community swing workshop at Joe’s Movement Emporium on April 11th from 5-7pm and a performance on April 15th at 7pm. Then come on up to Baltimore Theatre Project in June to see how this community project has changed. Each December, UpSpring offers a glimpse into the work of its students and instructors with a works-in-progress performance. 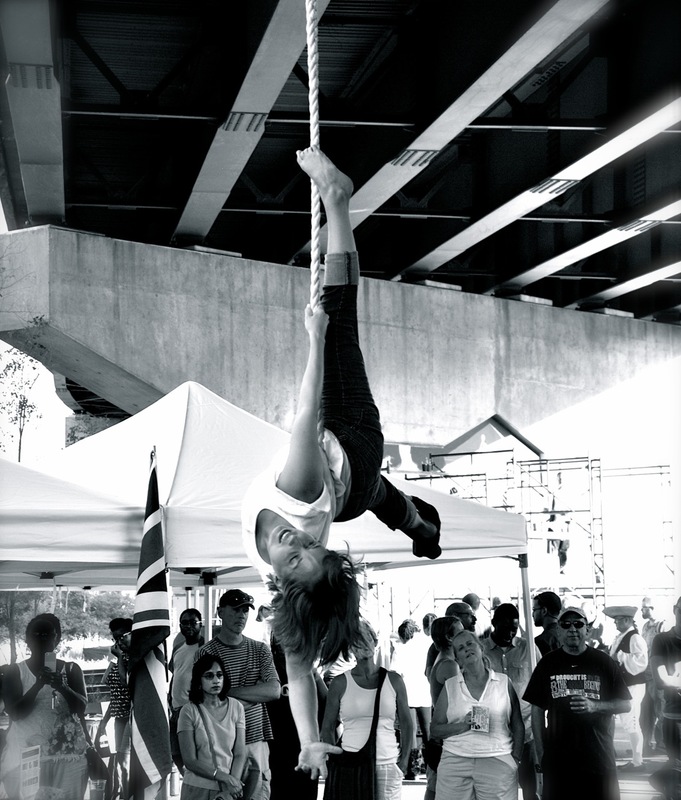 Acts include fabrics, lyra, trapeze, poi, and more. Tickets $15 at joesmovement.org. The Mount Rainier Elementary PTO will be hosting a raffle and selling concessions to raise money for arts programs in the school. Come on out and support the arts in your community! On Sunday, May 17th, UpSpring Studio travels upside down and sideways to places far away and close to home. Follow UpSpring’s intrepid aerialists as they embark on a journey of discovery and transformation on aerial fabrics, trapeze, and invented apparatus. Featuring special guest performances by Jessica John and Vaudoux Aerial Dance Theatre’s junior company (http://www.vaudoux.com) as well as poi artist Charlotte Byram. Tickets are $25 general admission and just $10 for children under 18! Tickets are available at Joe’s Movement Emporium, joesmovement.org. Performances can sometimes be arranged for corporate events. Please contact upspringstudio@gmail.com for details.